So you’re planning a road trip through Mexico. You have a) a weekend, b) one week, or c) longer. Where on earth do you begin? Do you visit the densely-forested mountains? Explore the deserts of Chihuahua? Soak up the festival culture in the cities or retreat to the Pacific coast? We sent Chris Moss to find the best routes, however long your stay. Mexico has the cultural clout of Argentina, the indigenous energy of Peru, the fashion and flair of Colombia and the economic vigor of the US. Arguably, it is the most exciting destination in the Americas. In recent years, its mega-capital, Mexico City (known as Distrito Federal or DF by locals), has become safer and far more stylish. Vibrant gastronomy scenes are flourishing in Condesa and Polanco and the once dead quiet Downtown has been repurposed as a cool place to live following investment from billionaire Carlos Slim and his pals. But Mexico is also massive. It is 2,709 miles by road, from Cancún in the Yucatán peninsula to Tijuana on the Californian border. That’s why you should plan any travel itinerary with care so you don’t spend more time in the air than on the ground. The most obvious place to start is with the out-there experiences: Day of the Dead festivals, mescal hangovers, manic mariachi bands. But there are breathtaking landscapes too, from the mountains of Chiapas to the photogenic deserts of Chihuahua to the beaches of Baja California. And then there is the pre-Columbian history. The Aztecs in the central plains and the Mayans on the Yucatán peninsula evolved into sophisticated civilizations – their pyramids, tombs, halls, walls and ball-playing courts form the essential stops in any serious Mexican itinerary. But what truly differentiates this country from any of its neighbors is the raw pride and energy of its people. 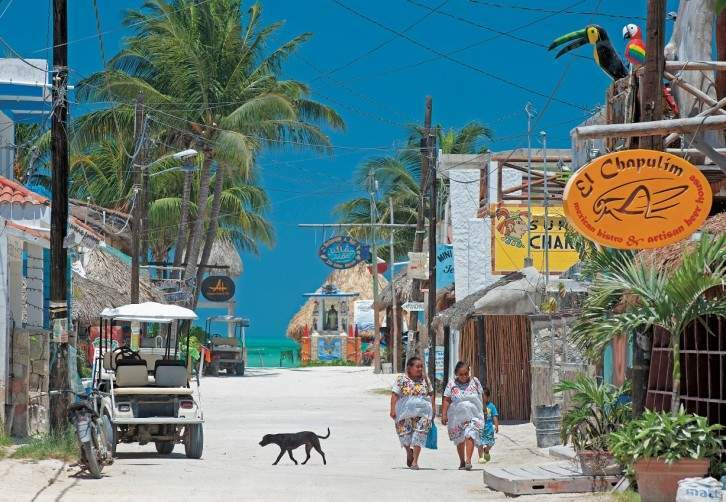 From Cancún to the capital, from Baja to the Silver Cities of the center, you will encounter superlative art, contemporary cuisine, awesome architecture and the clashing, dizzying colors of scores of native and mestizo communities – and along with all that, an unfailingly warm welcome. For a short and sweet stay you can’t beat the Yucatán peninsula. The crowds congregate on the Caribbean coast but if you need a break it’s far wiser to head inland. Mérida Airport – the region’s main airport until Cancún boomed in the 1980s – has an excellent runway with plenty of parking space for private jets. Better yet, it’s near its namesake city, a once-important and still-grand old place full of French and Italian style from which the so-called casta divina used to run their vast henequén (sisal) estates. Spend a day in the city to see the convivial plaza, the immense cathedral and the museums. The Italian-owned Casa Lecanda is a beautiful hotel in a colonial-style edifice and, at only seven rooms, is ideal for booking out for exclusive use for you and your party. Be sure to take one of the garden suites for yourself – they have romantic four-poster beds and oil paintings by renowned local artist Malena Peón. While you’re there arrange a cooking class with chef Christian Bravo. Spend your second night in the Starwood-run Hacienda San José Cholul, located a little further out in Tixkobob. This luxury estate – a former sisal ranch – has huge guestrooms, an extraordinary restaurant, plus a beautiful pool, chapel and glorious subtropical gardens. Alternatively, the Coqui Coqui Coba Residence and Spa is a top-end option for those who want unadulterated luxury. Stay in the King Palapa suite, which has a stunning deep cement-cast bathtub. Your final day is best spent exploring the three awe-inspiring Mayan sites nearby – Dzibilchaltún, Edzná and Uxmal. Though arguably more interesting is Izamal, a perfect illustration of how Mayan buildings were incorporated into Hispanic towns. If you’d like a structured visit, book a private day tour with Journey Mexico, which has a fleet of vehicles at its disposal, including yachts and jets. Though you may prefer exploring (and getting lost) on foot – all part of the beauty of adventuring. Next week, Chris Moss discovers where you should visit in Mexico if you’re staying for a week or even longer, including Chichen Itza, Isla Holbox and Mexico City.